Back cover blurb: Cornwall, 1940. In the hushed hours of deepest night a young woman is found washed up on the rocks. Was it a tragic accident? Or should the residents of Penhallow have been more careful about whom they invited in? In the midst of war three women arrive seeking safety at Penhallow Hall. Each is looking to escape her past. But one of them is not there by choice. As the threat of invasion mounts and the nightly blackouts feel longer and longer, tensions between the close-knit residents rise until dark secrets start to surface. And no one can predict what their neighbour is capable of . . . In a house full of strangers, who do you trust? Diana, Jane and Rose are land girls billeted to Penhallow Hall in Cornwall in 1940. Rose ,the elder of the three girls has history with the local area, and has high hopes that she might run into an old acquaintance. Diana is younger, more determined, some would say bolshy one. Rose, the practical, friendly one. Jane, the youngest of the women, is actually related to the owners of Penhallow Hall, but doesn't exactly receive the warm welcome that one would expect. In fact, it's almost as if Jane isn't welcome there at all. It is clear that Penhallow has its secrets, as do each of the three women. So different in personality, but thrown together by circumstance and determined to do their bit for the war. Set against the backdrop of World War II, The Stranger is exactly the kind of historical fiction novel that I love. Full of mystery and intrigue, with enough detail about the surrounding times to make you grateful to all who contributed towards the war effort. 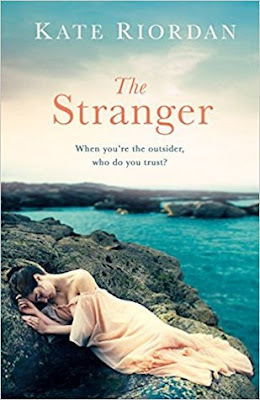 As always I look forward to Kate Riordan's next novel. The Stranger is available now via Amazon online and all good book shops.